Maybe this bothered me because I am the son of 1st and 2nd generation immigrants to this country. Or maybe because I am sensitive to the fact that my Dominican born and raised mother, who graduated from college in the United States, is still chided constantly about her accent and occasional lack of syntax. Or maybe I just woke up on the wrong side of the bed this morning and was ill prepared for the long commute to work today. Maybe. I couldn’t ignore the fact though, that I saw this sprawled in a part of Queens that was able to successfully alter the development of a public housing project back in the early 1970’s. A housing project that was intended to bring folks in primarily of minority races. Bringing in minority and new immigrant people into this section of Queens, into Forest Hills. People that potentially did not speak English. While I’m a huge fan of Forest Hills and the various cultures it is surrounded with, there is an air of exclusivity that you cannot shake. I understand that I have been privy to many varied facets of life in Queens, (partly due to the platform I created), but I also understand innately, that I will never attain the privilege of the folks from here, of here. Almost a month ago I was contacted by Jackson Heights resident and artist Ricardo Andres Verdesoto Rugel to help him find exhibit space for his phenomenal photo series titled "Mujeres." We have a some prior history with Ricardo here at Queenscapes, as he was one of the artists that participated in our two part "Queens for Puerto Rico" #QU4PR fundraisers last November 2017. Ricardo donated three large portraits of his "Mujeres" series and I knew automatically that these amazing photos should eventually be displayed on their own. Since we were in the month of March, I came up with the idea to tie in Ricardo's photo series with a Women's History Month theme. I turned over the reigns of my Instagram page to Ricardo for the week, allowing him to showcase one photo a day with his artist process in an effort for him to get enough exposure to get a venue to showcase his work in his adopted hometown of Jackson Heights, Queens. We titled the Instagram campaign #MujeresExhibit18. 50% of all photo proceeds were to be donated directly to Voces Latina, a Jackson Heights based non-profit agency that provides HIV/AIDS and Violence preventive and intervention services to the immigrant latina community in a culturally sensitive manner. "Fútbol is known worldwide to be predominantly considered a "man's sport," but in my eyes there hasn't been enough attention brought to the women who are fans of the game - especially underrepresented minority women. 'Mujeres' emphasizes on showcasing soccer jerseys as day-to-day lifestyle essentials, from the die-hard fan to the casual fan to wear. ""I want to influence change, and rewrite the way we think about who the fans of the game are. It has become a movement, embracing female empowerment in diversity." Recapping quickly, the 2 day pop-up exhibit of "Mujeres" was a awesome success. It garnered a bunch of attention and opened doors for Ricardo to show his work again and with more detailed programming. Thank you immensely to all the folks at Arepa Lady for believing in this project, to all the amazing people who came out and attended the exhibit, and last but not least all the positive and tremendous support and feedback we received on social media. Two weeks ago I was invited to the Godwin-Ternbach Museum at Queens College by Christy Bencosme, to attend their latest exhibit, "Waging Peace: 100 Years of Action." "The Godwin-Ternbach Museum at Queens College was founded in 1981, but the Queens College Art Collection reaches as far back as the 1930s, with the founding of the College in 1937 during the Great Depression. The Museum has a distinguished history due to its founders. Ternbach, a noted art restorer who settled in Queens after escape from Nazi persecution in Vienna, attracted eminent donors like Norbert Schimmel, Jack and Belle Linsky, and Charles B. Rogers, who were patrons of the Metropolitan Museum, National Gallery of Art, and Smithsonian Institution; Leon Pomerance, Ernest Erickson and Syril and Walter Frank of the Archeological Institute of America; Hans Arnhold, founder of the American Academy in Berlin; and Elie Borowski, founder of the Bible Lands Museum in Jerusalem." Bencosme, a staffer at the Godwin-Ternbach Museum appealed to me to come out to Queens College, in hopes of bringing more awareness to our current politic climate. My responses to event invitations are always uniformly and unequivocally the same, I'm honored every single time. Even though it feels like lately I can't make all my committments, I'm always immensely grateful that Queenscapes is considered a cultural presence in Queens, and I try my best to make sure I return the favor and oblige each and every request. "Waging Peace: 100 Years of Action" is an interactive exhibition organized by the American Friends Service Committee. 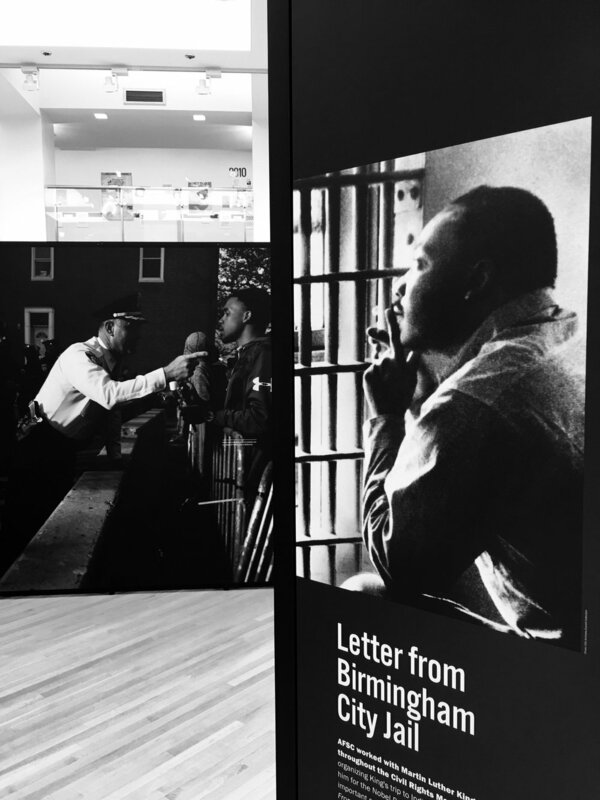 Using provocative stories told by those who have fought against injustice, this exhibition demonstrates the effectiveness of nonviolence to build justice, overcome oppression, and to prevent violence. Through displays of historic artifacts and interactive media visitors explore the main themes of the exhibition: 1) Building Peace, 2) Ending Discrimination, 3) Addressing Prisons, 4) Just Economies, 5) Immigrant Rights and 6) A Call to Action. The GTM will expand on the exhibition themes by including historical posters, photographs and documents from the museum collection and the QC Civil Rights Archives. These materials offer firsthand accounts of the fight for social justice by Queens College students and faculty. I attended this exhibit this past Saturday with my two young sons, Roman & Saul, ages 12 & 11 respectively and I am happy that I made the decision to bring them along. "Waging Peace" is an elaborate piece of work, that shows the slow progression of global equality in the world, and along the exhibit, asks it audience to get involved and help find an answer. I was particularly floored viewing the timeline upstairs, which left my wondering how even with all our advancements in so many faucets of life, we are still dealing with discrimination in our country, on a very real level. In short, "Waging Peace" is one of the most insightful and educational displayed works I've seen in a really long time, and is a MUST see for audiences of all ages. Christy, thank you immensely for the invite and also for shedding light on an exhibit, and on an institution that I will surely be visiting again. "Wages of Peace: 100 Years of Action" is up until March 17th and is free and open to the public at the Godwin-Ternbach Museum at Klapper Hall, inside the campus of Queens College in Flushing, Queens. Tiffany Smith is an interdisciplinary artist from the Caribbean diaspora who works with photography, video, installation, and design to create photographic portraits, site responsive installations, user engaged experiences, and assemblages focused on identity, representation, cultural ambiguity, and displacement. Using plant matter, design and home decor elements, pattern and costuming as cultural signifiers, visual references from an array of multi-cultural influences, derived from her upbringing between Miami, Florida, Nassau, Bahamas, and Jamaica inform images and installations that examine their subject’s individual narratives. Smith’s practice centers on what forms and defines communities of people color, in particular; how they are identified and represented, and how they endure. I met Tiffany Smith last summer on a freelance assignment for the Queens Times Ledger to cover her installation in Malba, Queens for the Malba Arts Project, aptly titled, "Meet Me in Malba: Carribbean Queen of Queens Edition." While I did some research on Smith's work, I wasn't sure what to expect from this installation. The minute I got there though, I knew I was in for a treat. Tiffany successfully transformed one of Queens' least ethnic neighborhoods into a full Caribbean oasis. If you didn't feel the vibes after entering her sailboat on the lawn, the house's visual and audio delights sold you and right before you left, Smith's homemade Carribbean curry got you hooked on the entire experience. About International Women's Day (8 March) International Women's Day (March 8) is a global day celebrating the social, economic, cultural and political achievements of women. The day also marks a call to action for accelerating gender parity. Charlie Eisenbach is the unofficial photographer of both the Boys & Girls Archbisop Molloy High School basketball squads and runs a page dedicated to the Girls squad. Charlie took on the impromptu role when his daughter Averianna made the girls varsity team. Molloy is located in Briarwood, Queens and has been around since 1957 as boys catholic school until 2000 when it finally became co-educational and opened its doors to women. The school has long been known for its dominant athletics program in New York City. Legendary baseball and basketball coach Jack Curran ran their program for over 50 years and produced two LeFrak City Queens born and raised future NBA point guards Kenny Smith and Kenny Anderson. Today, the school continues its rich tradition in basketball dominance with the two basketball players shown in the photo above, Moses Brown, McDonalds All-American and the #1 ranked high school center in NYC is from Hollis, Queens and is pcitured in the foreground and Cole Anthony, who is being recruited by Duke, Kansas, & Georgetown, is the son of former NY Knicks guard Greg Anthony and hails from Jamaica, Queens is shown here in the back. This photograph is one of many great photos taken by Charlie which he features on both his personal Instagram page @kickhisasscbass as well the unofficial Molloy girls page @amhs.girlsbasketball. By day Charlie, the Brooklyn native is a veteran employee of the City of New York Department of Sanitation, and how I came to learn about Charlie was through the photography he took of his DSNY co-workers. Via his personal page, Charlie posted images that showed an incredible insider perspective that could only be captured by one of its own. To this day Charlies DSNY images are one of my favorite original photo stories that I have discovered on Instagram. I feel like I learn something new about his co-workers and the job, even though he doesn't provide much written context. His photos really tell a story on their own, highlighting the humility, strength and toughness of his co-workers. He is currently putting together a pitch deck for a coffee table book of these DSNY photos. I consider Charlie a friend and have been fortunate to call him a supporter of Queenscapes for a while now. He attended our first photo walk in Long Island City back in 2015 and was the also the featured lead for our collaborative photo exhibit, #RootedInQueens16 that exhibited at the now shuttered QNS Collective also in L.I.C. Over the years, and seemingly without much strategy, Queenscapes has and continues to evolve from my own personal Instagram photo project to a virtual cultural quide of Queens. It's been an amazing transformation to watch firsthand how many folks refer to the page and directly inquire with me about the latest happenings in Queens. I've been extremely fortunate to have built a network of a few Queens based influencers in many different fields. For them I rely on a lot of the material I post on Queenscapes. But these amazing and generous few are not the only sources I rely on for Queens news, upcoming events and even the basis for own group photography exhibits. Our main source for most Queens news is simple: Queens newspapers. I spend more time perusing local Queens publications than actually taking photos. The Queens Courier, The Queens Chronicle, The Times Ledger, The Queens Tribune, The Queens Examiner and even the Queens Library Magazine are all on my go to list each week. So while we already give you photography and culture and event updates at Queenscapes, we will now also give you some Queens news. #QnsWeek will be offered by us via our Instagram story feed and will consist of all the stories we feel should be highlighted in Queens each week, along with upcoming special event updates. With the new Instagram "highlight" feature, it allows us to archive and keep these stories available long past the usual 24 hour viewing period. So far the feedback has been super positive and we hope to get more in depth each week. We are relying on you to tell us about the things you want to see more of in Queens. This feature just like everything else we do, is for you. “Every ending has a new beginning.” For the last Instagram post of 2017 (and fittingly the 1799th 😉) I announced that the end of 2017 also marked, the beginning of the end of me and my family's time as Queens Village residents. Roman and Saul Vazquez enjoying New Years Eve Dinner. It’s in Queens Village that we first tackled the notion of a diverse yet divided cultural oasis. Queens Village allowed us in, and the folks over at the Citizens Committee of NYC and the Queens Library enabled us to make a difference. So as an ode to our limited time left in Queens Village, or Q.V., as it is affectionately known to long-time residents here, I will offer you a closer personal perspective, a much more intimate look than you usually see on this page, into my last days and my family’s last days as a current Queens Village residents with the photo series titled, #AdieuQV. From today Sunday, December 31st up until Wednesday January 31st 2018, I’ll post one photo a day on Instagram, to also be shared on Facebook and Twitter offering a candid look at our little section of Q.V. So while we will still look forward to all our amazing (and more publicly funded projects) to debut in 2018, we’ll slow the clocks down a bit to reflect and reminisce and to show our gratitude for our time here. A little over a month and half ago, our Lead Curator Salvador Espinoza suggested that we organize a fundraiser for Puerto Rico to get help to the island after the devastation that was left behind created by Hurricane Maria. After some thought and preparation we came up with an idea for the Queens for Puerto Rico Relief Fund or #QU4PR. We teamed up to collaborate with Christian San Martin or otherwise known as The Visual Vandal, Bridget Bartolini of the Five Boro Story Project & Wendy Angulo of Wendy Angulo Productions and presented the #QU4PR photo and art gallery which focused on a dual theme of Queens community and Puerto Rican culture. The exhibit featured at two very different locations and two very unique venues in Queens. The first event took place at La Gloria Restaurant and Lounge in the heart of Jackson Heights, Queens. We choose La Gloria primarily because we were looking to collaborate with the talented and community driven Christian "Pookierazzi" San Martin. Also known as The Visual Vandal, Christian has hosted the popular Boulevard Brunch at the La Gloria for over a decade. Also invited to the first round of #QU4PR were Queens Village resident D.J. Dubbcity and D.J. Steph Cakes. While we were planning our first event, we were contacted by Paul Serelis, owner of Vintage Wine Bar. Paul supports a local charity every month by donating 33% of his earnings from a select red & white wine. Tabbed as the Wine of the Month program, Paul choose Queenscapes and the "Queens for Puerto Rico Relief Fund" as his charity to support in November. To compliment these efforts, Paul also invited us to host a second fundraising event at the end of November. Because our first fundraiser focused on engaging community through a celebration of cultures, we thought it would be interesting to go a different route with the second fundraiser and concentrate on community building. To flesh out a program with no music and crowd engagement, we invited Bridget Bartolini, founder of the Five Boro Story Project and Wendy Angulo of Wendy Angulo Productions and incorporated story telling and spoken word artists along with poets who supplied performances that supported our main theme of Queens community and Puerto Rican culture.Nelson Lugo, Jessie Cotto, George Torres, and Joselynn Cortes all turned in amazing performances. Their pieces served as a fitting precursor to a subsequent open forum discussion geared towards folks speaking on current community projects and or upcoming ideas. Giving Tuesday, often stylized as #GivingTuesday for purposes of hashtag activism, refers to the Tuesday after U.S. Thanksgiving in the United States. It is a movement to create an international day of giving at the beginning of the Christmas and holiday season. Giving Tuesday was started in 2012 by the 92nd Street Y and the United Nations Foundation as a response to commercialization and consumerism in the post-Thanksgiving season (Black Friday and Cyber Monday). Long Island City, Jackson Heights, Elmhurst, Corona, Rego Park, Forest Hills, Kew Gardens, Jamaica, Ozone Park, Flushing, and Bayside. Below is a list of the top 10 programs compiled by Jennifer Weil, Communications Coordinator at QCH. 1. Queens Center for Gay Seniors - This is a Senior Community Center where LGTBQ+ seniors feel welcome and receive recreation, a hot lunch, field trips and other incredible opportunities.They literally just climbed Mohank Mountain together! They have all the fun! We also have a similar programs for LGTBQ+ teens! 2. Our Social Adult Day Services Program - This program is particularly dear to my heart as it opens daily and offers support, social engagement, and therapeutic activities to older adults who are physically frail, socially isolated and/or memory-impaired. 3. Our Young Women's Leadership School - Everyday after school we teach middle school girls that they can do anything they put their mind to! Our girls recently competed in an Engineering competition where they placed 2nd! They are currently working on building their own robots! GIRL POWER! 4. Our Queens Connect Program - This amazing program trains out of school youth to become a part of the culinary field. After a six week program, they graduate with their safe food handler's license, many hours of in-kitchen training from an NYC chef, and placement in an internship where they work in a real NYC restaurant. Many of our graduates have gone on to open up their own business and become a part of the NYC culinary scene! 5. Our English Classes for Adults - We offer free classes three times a day to adults who want to learn English! Queens being the diverse place that it is - this is an incredible opportunity for so many people in our borough! 6. Our Immigration Counseling and Support programs - This important programs serves immigrants and their families - Carmen, the director (or as I call her Super Woman!) helps so many families get the information they need to become citizens, turn in documents, apply for DACA, etc. She had so many calls this past year her cell phone BROKE! 7. College Access and Success Program - We not only operate alternative highschool for students who don't fit the traditional mold of High School, but we also offer all kinds of College Access support with our CASP Program! Mentors and counselors help our students stay on track to graduate and apply to college. We have so many students in colleges across the country because of this program! 8. Friendly Visiting Program - I LOVE this program! Basically, any individual in our community can volunteer to be a "Friendly Visitor" to a home-bound senior. Meaning, that volunteer visits the senior weekly or bi-weekly just to hang out and chat. Maybe play games or take a walk. Many home-bound seniors are alone for most of the day, so this provides that perk in their day! We also deliver Meals of Wheels with FIVE vans a day barely covering our case load! 9. Teen Centers and Break Dancing - Our teen centers are open everyday until 10pm to allow for teens to have a safe space to socialize, play basketball, etc. One of the most popular teen programs we have is our Break Dancing programs! Breakers from ALL OVER THE WORLD come to our program to learn from our students and battle each other. We host events that pack our community center like no other program can! 10. And of course, a cause near and dear to my heart - our ELEVEN After School programs in Queens! I spent the last ten years in the After School world - so it warms my heart to know that over 10,000 kids have a safe place to go after school. In short, Queens Community House is an amazing organization that does amazing things for the people in Queens, and they need your help to stay afloat, thriving on public donations. "The island is trying to survive, this is not living" quote by Joselynn Cortes, photographer and Queens native who has recently volunteered her time and much attention to the relief efforts in the wake of Hurricane Maria in Puerto Rico. Along with starting a GoFundme page that has raised almost $5K in little over a month, Joselynn has spearheaded multiple hurricane relief drives for Puerto Rico. Cortes, also of Puerto Rican descent, made her first trip to Puerto Rico on Friday, October 6th, 3 weeks after Hurricane Maria initially hit. She arrived into the capital of San Juan on a one-way ticket, with over 350 pounds of supplies to disperse. She rented a car, and with a simple map, and NO GPS, Joselynn drove the entirety of the island, visiting Quebradillas, Utuado, Lares, Aguadilla, Aguada, Rincon, Moca, Mayaguez, Guanica, Yauco, Maunabo, Yabucoa, Humacao, Trujillo Alto, La Perla, Guajataca Dam, Patillas, Caguas, and San Lorenzo. Joselynn passed each town, not only dropping off items, but also taking inventory of relief items still needed from the mouths of the folks of the island. Joselynn also spend valuable time with the people of Puerto Rico, hearing their tales of survival and their stories of Puerto Rican orgullo, stories of strength under fire, all while documenting her journey for 7 days. Her second go-round was on November 2nd, where she stayed for 2 weeks and saw the same families she saw on her first visit, with all the items she promised she would bring back to the island. Tonight, Joselynn will host "Poco-A-Poco" a photo inspired fundraiser, where she will feature photos and raw footage of a hurricane devastated island at Hello Brooklyn located at 234 Union Ave, in Williamsburg, Brooklyn. Come out to hear her story, view her photos, and support a Puerto Rico still in dire need of help, 2 months after the storm. Super ecstatic to announce that the team over at @DitmarsVintage will be dedicating their November’s Wine of the Month proceeds to the Queens for Puerto Rico Relief Fund! Their Wine of the Month program donates a whopping 33% of sales from 2 specific wines to a new local charity each month, and this month they are choose our #QU4PR campaign. Vintage is a multi-purpose wine bar/coffee shop in Astoria that emphasizes in using local, organic, green products and vendors. They are also dedicated to the Queens community, and each month they work closely with neighboring businesses and local organizations. To complement their donations, the folks over at Vintage have invited the @Queenscapes team over to their location in Astoria as a follow-up to tomorrow’s relief benefit at @LaGloria in Jackson Heights. We’ll have a second print sale (with all of tomorrow’s unsold work) at Vintage, located at 23-14 Ditmars Boulevard, in Astoria on Wednesday, November 29th 2017 at 6:00pm. 100% of proceeds to be added to total collections for the Puerto grassroots non-profit @conPRmetidos. Purchase a designated @DitmarsVintage Wine of the Month anytime in November. While things slowly get better after the destruction caused by Hurricane Maria in Puerto Rico, the island is still in a critical state. Puerto Rico is still severely lacking in resources and folks still have very limited access in transporting relief items throughout the island. So in an effort to help our neighborhood abroad, the Queenscapes team has partnered with Queens native Christian San Martin otherwise known as the Visual Vandal to create "Queens For Puerto Rico" #QU4PR: A Benefit for Hurricane Maria victims. The Queens based relief event will take place at La Gloria Restaurant and Lounge in Jackson Heights, Queens on Wednesday, November 18th 2017. The event, hosted by Queenscapes own, Denise Rea, will feature photographs and artwork from a multitude of Queens based artists, raffle giveaways donated by Queens owned businesses and live music from born and raised D.J. 's DJ Champ Beatz and D.J. Butch Rock. All money and items donated for the event will go to Puerto Rican charities, ConPRmetido and The Puerto Rican Family Institute. 100% of the event's monetary proceeds will go to ConPRmetido, a San Juan based independent, non-partisan and non-profit organization, established in 2012. This grassroots organization's mission is to strategically engage the island's diaspora's resource to implement solutions. All items will be donated to The Puerto Rican Family Institute. The Puerto Rican Family Institute, founded in 1960, is a nonprofit, multi-program family oriented health and human service agency whose primary mission is to prevent family disintegration and enhance the self-sufficiency of the Latino community. Minimum donation for entry to event is $10.00. You can make a donation directly on http://www.conprmetidos.org or pay at the door on day of event. La Gloria will accept the following relief items, toiletries, first aid kits, cleaning supplies, work gloves, hand sanitizer and canned goods, but will not accept clothes of any kind. Tommy Lasorda, one of baseball's greatest managers ever to coach the game once said, "The difference between the impossible and the possible lies in a person's determination." When I met Ashley Dean, lately known as the Queen of Astoria, a few years back, the first thing that stood out was all the ambitious goals she held. After working with her on countless events (both mine and hers) over the last two years, I have noticed that she is more determined to realize all her lofty goals and dreams, than most people I have ever met. For myself, a Queens born kid, it has been an honor to watch this adopted Queens kid do her thing, in my home borough. From lending a hand in volunteer efforts in parts of Queens where even Queens born residents would never touch foot in, to organizing the 2nd Annual Hip Hop Festival to debut at the Queens Museum this Friday night, Ashley is accomplishing all her goals, one by one. Click on the link below for details & to purchase tickets for the 3 day event. See you guys there. Known to most insiders as "The Barn", the Corona Railyard serves as the home yard of the IRT Flushing Line 7. It is located in Flushing Meadows–Corona Park near Citi Field, the National Tennis Center, and the site of the 1939 and 1964 World's Fairs. While most of the photographers who come to the Corona Railyard look to shoot the wide angle view of the many trains lined up side to side, lately I am starting to find intrigue in the outlying sections of the railyard. The sections of the railyard that feature the trains old rusty abandoned pieces, as well as the newer shiny colorfully packaged train parts, yet to be installed. There is something visually pleasing to the eye when you contrast these old brown and new blue parts, amongst other industrial knick knacks, against the gray gravel backdrop of the railyard floor. Throw in some shadows, and add some key light that ALWAYS seem to drop down into the depths of this spot, no matter what time of day, and you get some really interesting images. Curiosity always gets me though. What part was taken from what part of the 7 train? What new piece still in wrapping, will serve in making the 7 train faster? And on a different level who decides on how these items are arranged so haphazardly on the ground? Hopefully, I will take a tour soon, to get some of these questions answered, but in the meantime, I have fun wondering. So the next time you come out to the Corona Railyard, trying to chase the perfect sunset light to bounce off the top of those mammoth silver cars, think about moving your lens behind the light and into the shadows, you might find something you never knew existed. In 2015, John Wang left the state of his native Texas, and headed out to Queens with the ambitious goal of opening the first ever night market in New York City. Three years later, the Queens International Night Market features over 50 food & art vendors combined, a beer garden and also invites multiple performers each Saturday to the back lot of the New York Hall of Science in Flushing Meadows Park. "First and foremost, I wanted to create a beloved and welcoming cultural event - a community that prioritized affordability and inclusivity. I wanted to really leverage and celebrate what I thought was one of Queens' and NYC's greatest assets: its unparalled diversit." says Wang. Following John and his very early days with the Queens Night Market starting at the small parking lot at the the New York Hall of Science, I was super impressed and proud to see how far he has come with this simple yet awesome idea. On a good weather day, the Night Market easily attracts over 8,000 diverse visitors a night, and has become one of Queens' top summer attractions, and with a pretty reasonable price tags for ANY food item on sale, you cannot go wrong. If you had to attend only one Queens event that captured the true essence of Queens' international flavor, the Queens Night Market which has featured over 130 food vendors in over 60 different countries, is the one to attend this summer. Go to queensnightmarket.com now for more details. Growing up in Jamaica, Queens for a significant chunk of my life, you could not escape the existence of the "Dollar Van" circuit, and if you grew up like us without a family owned vehicle, you could not escape how essential Dollar Vans actually were. Birthed in 1980 after an eleven day MTA strike in New York City, the Dollar Van, (which is basically a larger sized gypsy cab) arose to help folks, primarily Caribbean immigrants, to get to and from work each day. Given the tab "Dollar" because it matched the fare of a typical one-way MTA ride at the time. Dollar Vans became less practical to use once the MTA introduced free bus to subway transfers in 1996, because it would cost almost double if you still had to use the subway. The popularity of these Dollar Vans however never really waned. Because of the overcrowding of a typical MTA bus during peak hours, and the huge population growth of Southeastern Queens, it looks like the Dollar Vans are here to stay. It has been established that Queens has at least seven Dollar Van Lines. Five that run from Jamaica up to the border of Nassau County and even extending in Valley Stream, Long Island, and two that originate in Manhattan's Chinatown and end in Chinatown Elmhurst and Chinatown Flushing. While the vans that service Southeastern Queens are primarily Caribbean owned and run, they are not exclusively used by any one ethnic group. The vans that occupy two out of the three Chinatowns in Queens (the third in Corona), are widely accepted to be shuttles that predominantly service the Chinese community. These Chinese lines are much smaller and don't run as frequent as the Jamaica lines. - Q83 route via Liberty Ave to Laurelton. - Q4 route via Linden Blvd to Cambria Heights. - Q5 route via Merrick Blvd to Valley Stream. - Q111 route via Guy Brewer Blvd/147th Ave to Rosedale. - Q113 route via Guy Brewer Blvd/Rockaway Tpke to Far Rockaway. words by Adolfo Steve Vazquez map provided by the New Yorker Magazine. This past weekend on Sunday, July 23rd, veteran street photographer Ronald Daza, also known as @Nevasatisfied, attended the annual Colombian Independence Parade of New York City held in Jackson Heights, Queens. Daza, the talented and respected photographer has shot for clothing labels 10.Deep and SSUR, and has also been featured on the up and coming Street Dreams Magazine. The long time Queens resident of Colombian descent bared the humid temps and rainy weather to capture the joyous occasion. One of Queens' most colorful and well attended parades, it featured salsa & cumbia dancing, scenes of Colombian orgullo, and dozens of street vendors selling everything red, yellow & blue as Colombians celebrated their Independence from Spain. It was projected that over 75,000 folks came out to the parade that runs on Northern Boulevard from 74th Street to 86th Street. To see more of Daza's wide-ranging work go to his popular Instagram page: @nevasatisfied. I started the #Queenscapes hashtag as a response to an Instagram Weekend Hashtag Project on January 1st 2014. If I remember correctly it was #WHPResolution and my resolution was to visit every single Queens neighborhood and sub-neighborhood and feature each one on the Instagram social media feed. As a proud lifelong Queens resident the idea was to capture all of Queens' various landscapes in hopes of learning more about the terrain I was so innately connected to, hence the name Queenscapes. With no photography experience, I grabbed my IPhone 4S and ventured out and captured a different Queens landmark every day for 30 days straight. Eventually, as folks starting noticing, I slowed down and started noticing some things myself. I noticed after living in Queens for 35 years that this borough was more than just its varying landscapes, more than just being the borough with the distinction of having the most neighborhoods in all of New York City. I noticed that what makes Queens special was and still is the story of the diverse people and cultures that occupy these 109 square miles. So today with a strong sense of reminiscence after the completion of OUR 1718th post dedicated solely to the borough of Queens on 07/18, I am grateful. Grateful for all the folks who have followed and validated this Queens kid's journey and exploration of his hometown. Click on our logo on the Queenscapes instagram page for today's special photo story commemorating the day that matches our zip code - #718. Photojournal spotlight - "Willets Point"
"The struggle is part of the story." That quote sums up my immediate thoughts every time I passed the area known as the Iron Triangle in the Willets Point section of Corona, Queens, specifically the immigrant struggle. On first sight, The Iron Triangle was just an oversized junkyard that sat on unsteady and permanently flooded terrain. If you look a little closer though, it was evident the soul of this place lied in all of the undocumented immigrants that worked in this area. The folks (primarily men) you encountered, were right on the lip of the Iron Triangle, right off the numerous curbs off 126th Street. These men were colorful, they were animated, and they were in your face. If you drove down this area looking to replace your rearview mirror, you knew the jockeying of position to get as close to your car as possible was a deliberate move. Each man had a different approach to lure you into the garage that they would be eventually receiving a cut from for their effective referral. From sun up to sun down, this place was bustling and it was loud, and it was from sounds indicative of folks struggling to survive. My favorite photographic work from this area comes from Salvador Espinoza. You know Salvador, if you are familiar with Queenscapes, because he is the man behind all the curatorial work for the many exhibits we have featured since 2015. Salvador presented his photojournal, "Willets Point" a couple of years back, and the first time I saw it, it was the first time I was exposed to his photography. Salvador used various different formats to shoot a black and white body of work that is stark and descriptive and shows his subjects with a warmth and dignity that is not usually reserved for folks that are being wantonly displaced. "The Iron Triangle seems to possess its own unique rhythm at a time when most neighborhoods in New York all seem to be in predictable in its uniformity," Salvador writes.